This charming stone flower girl (above) was found lying in a bramble patch when the new owners were clearing the bottom of the garden. The statue has a deep gap and a hairline crack across the shoulders. Use our guide to repairing a garden statue to fix similar damage so that frost and freezing temperatures can't make things worse. For more advice on DIY projects, visit our dedicated DIY section. Find out how to design a garden from scratch, then head to our dedicated garden hub page for more garden-related advice. A carefully chosen statue acts as an attractive focal point in your garden design and provides interest throughout the seasons. 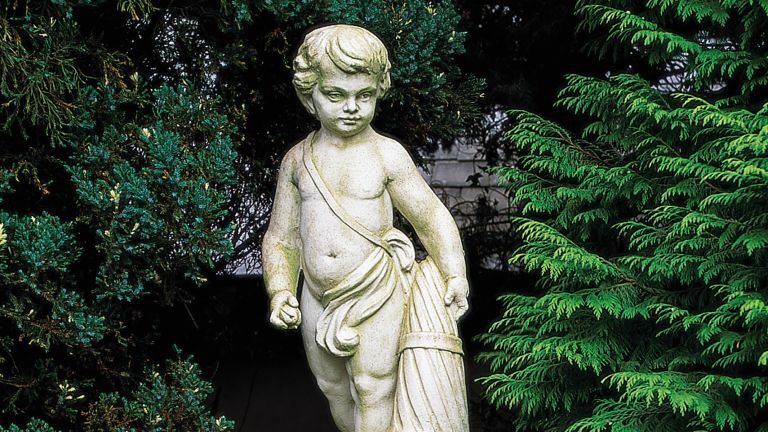 Garden statuary first became popular in the 17th and 18th centuries when well-heeled travellers returning home from the Grand Tour wanted to emulate the glorious ornamental Italian gardens they had seen, featuring stone pillars, seats, fountains and figures. Stone is the customary material used for statuary. It is durable and can accommodate fine carved detailing. Nowadays modern machine tools supplement the craftsman’s traditional mallets, chisels and rasps. This speeds up the process but stone carving still demands a good deal of skilled craftsmanship and the cost of stone products reflects this. A less expensive option for statuary is reconstituted or cast stone by companies such as Haddonstone and Chilstone, who crush and grind natural stone, then mix it with a binding agent before it is re-bonded and pressed into moulds. The finished item can be made to look like marble, granite, sandstone or limestone, appearing so similar to natural carved stone that at first glance it is often difficult to tell them apart. Don’t attempt to repair a valuable antique statue, as visible DIY work can lessen the value. Instead, find a professional restorer through a reputable umbrella body such as The Institute of Conservation. Brush away moss, loose dirt and crumbling stone from the damaged area. Clean with mild detergent diluted in warm water to get rid of any ingrained dirt or grease. Rinse away residue with clean water and allow stone to dry out. Careful preparation now will allow the adhesive to bond well with the stone. First deal with the gap in the stone by filling with epoxy putty, known as Milliput. This product can be found in craft and hardware shops, and plumbers’ merchants. It’s available in five colours, Silver Grey being the closest to the colour of the stone in this case. Take equal quantities from each of the two Milliput sticks. Knead and roll the two pieces of Milliput in your hands for five minutes until the colours merge and become uniform and no visible streaks remain. Mix for a further minute. If you have sensitive skin, wear rubber or polythene gloves. Gently press the putty into the gap using a knife or spatula. Use a wet finger or a wet narrow spatula to shape and smooth the putty repair. At first the putty is soft but it will become rock hard after three to four hours. A hairdryer will set the putty in a few minutes, which is useful if you need to build up a repair in stages. Clean tools straight away before the putty hardens. The putty can be fashioned to create a missing or damaged part, such as a toe on this statue. If you are interrupted while you are mixing or shaping, put the Milliput into the freezer where it will keep for 36 hours. When you resume take it out of the freezer and warm it in your hands until it becomes soft and pliable. Deal with the hairline crack before moisture can be drawn into the stone, freeze and expand, leading to further damage. Choose an epoxy adhesive recommended for stone, such as Araldite Precision. Squeeze out equal amounts of the two-part resin kit and mix together thoroughly before applying. Wearing thin plastic gloves, use a circular action to rub a quantity of adhesive well into the crack – I used a cocktail stick to help guide it in. Surplus adhesive can look ugly if allowed to remain, and sets rock hard, so wipe excess off with a cloth dampened with white spirit taking care not to disturb the affected area. Any unsightly hardened adhesive can be removed with a sharp blade. Blend in the repair by encouraging moss and lichen growth. People have their favourite recipes to stimulate this including painting on milk, or rubbing with compost or manure, but most reliable is an occasional coat of plain natural yoghurt. From large architectural items to bird baths, planters and ornaments, reclaimed garden pieces have a wonderful weathered patina that can only be achieved through years of being outside. The advantage of buying an older piece is that you know it won’t crack during the first frost – chances are that if it’s already survived several winters, it’s likely to last a long time to come. Buy what you like, as it’s for you to enjoy, but always ask about condition, especially if not buying in person. Older garden items obviously won’t be in perfect condition but it is best to avoid anything with cracks, particularly planters. Once something has a crack, the frost can get in and break it unless it has been restored correctly. Also check for rot on wooden items. The main issues people face are matching the texture and colour of the repair, as well as making sure it is stable. If the item is antique, it is advisable to use a professional restorer. However, if you want to have a go yourself, an epoxy resin – a strong glue that will stick concrete and stone – is recommended. The stone must be completely dry for it to be effective. What should I pay for a garden statue? Prices can vary enormously so it’s best to shop around. Bear in mind that you’ll also need to factor in the delivery costs unless collecting it yourself, but most good dealers will be able to arrange this with trusted and reliable couriers. Sites such as Decorative Collective and The Hoarde represent lots of dealers in one place, so you can search for items you’re interested in buying and see the range of prices.